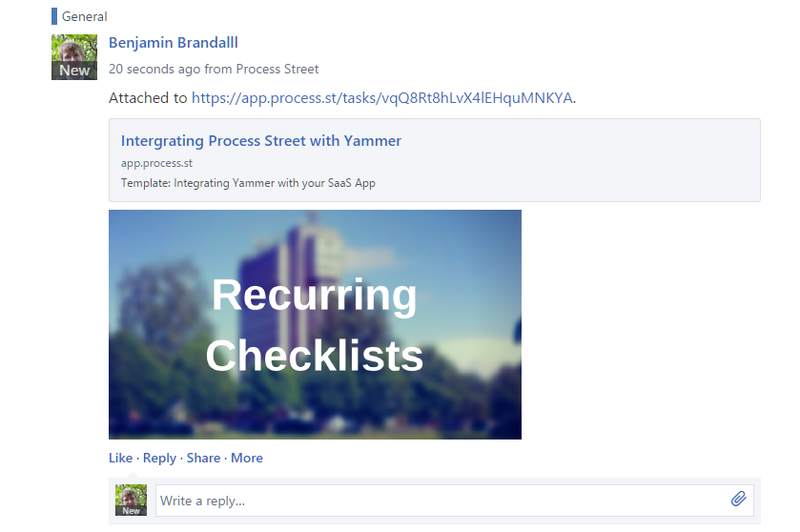 Announcing Process Street + Yammer Integration! Yammer could be described as Facebook for enterprises. It’s an enterprise social network that supports a range of integrated apps to combine the usual company and team group emails into one easily scannable feed. It has a main ‘public’ feed that could be compared to the office water cooler, as well as invite-only groups for departmental discussions and idea sharing (football banter and posting silly gifs). Even though some companies have offices in different countries, Yammer breaks these boundaries and promotes collaboration between teams, departments and branches, inviting comments, likes and other familiar social features. Part of the idea behind the ‘public’ nature of Yammer is accountability. No one can say they didn’t get the email or didn’t hear about the meeting if it was published openly on the company Yammer. The same goes for Process Street checklists, because now activity is pushed directly to the Yammer feed for all to see and interact with. Yammer now has over 14,000,000 users from more than 300,000 enterprises and is establishing itself as a home for open communication by promoting ‘working out loud‘. 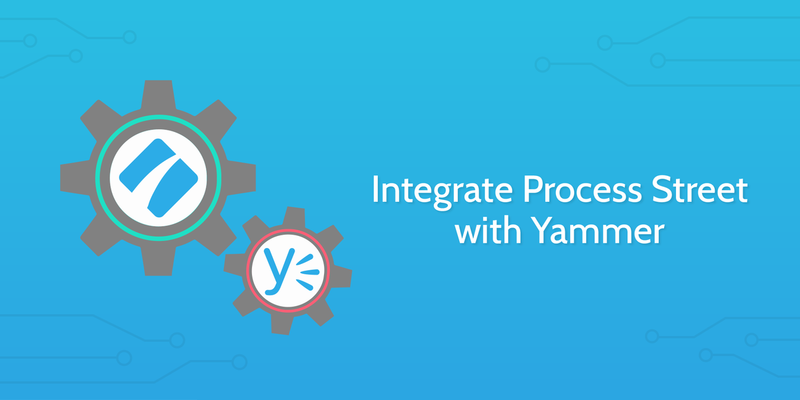 Introducing Process Street + Yammer! Process Street‘s new integration with Yammer makes it easy for teams to see what members are doing outside of Process Street. Access Process Street directly from the Yammer App Directory. How does it link up with Process Street? Comments, attachments and @mentions feed into Yammer in the form of messages that can be shared, liked and commented on. If your team already has either a Process Street or Yammer account, you can link the two by going to our Process Street for Yammer page and clicking “Login with Yammer”. Anyone with a company email address can be added to the group and will be automatically added to a linked Process Street organization at the same time. Naturally, checklist activity is indexed in Yammer making it a powerful, searchable database accessible by anyone in your business — promoting transparency and avoiding confusion. Working out loud, an idea promoted by Yammer but conceived by Bryce Williams, is one of the reasons Yammer and Process Street work so well together. Comments and attachments help to clarify difficult tasks and Yammer is a platform for discussion and problem-solving. These kinds of great things can only happen when employees are working out loud – e.g saying everything they’re doing. In the case of the Yammer + Process Street integration, much of that is automated, building an archive of information for all employees to see. Make sure your work is in the right place and being seen by the right people. 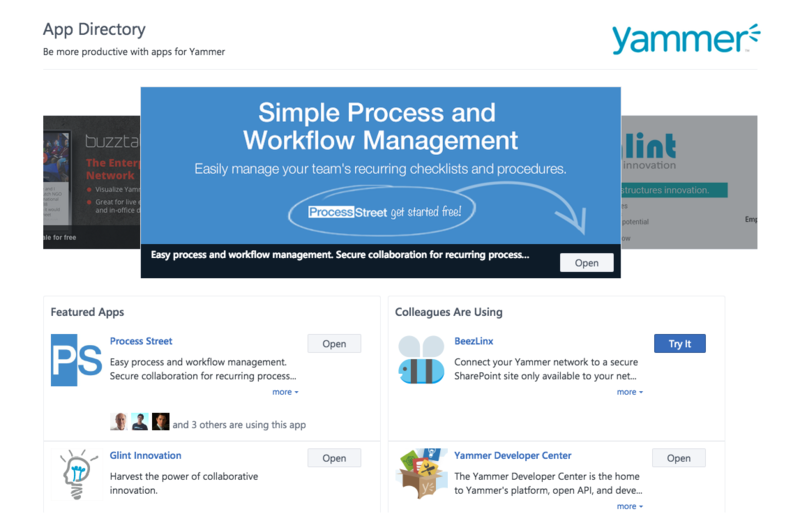 Link your Yammer account up with Process Street and start working better as a team with your co-workers.